The QuadSlimLine precision rotary axis have been specifically developed as an additional axis for any high precision Coordinate Measuring Machine to simplify the measurement of symmetrical or prismatic components including scanning applications by simplifying your measuring procedures, increasing your CMM’s application range and effective measuring volume which in turn increases the flexibility, productivity and efficiency of your CMM. Typical applications that benefit from the inclusion of a 4th axis include the measurement of component parts characterised by symmetrical or recurring features such as gas turbine disc, fan blades, gearing and impellers. The QuadSlimLine capabilities deliver new levels of accuracy, flexibility and performance over a wide range of calibration and inspection applications. The combination of sub arc second positioning accuracy and bearing geometry of less than 0.0005mm ensures the minimum impact on your process measurement uncertainty. Shorter setup times, increased flexibility and productivity, simplified stylus configurations and part programs, increased effective measuring volume of CMM. The cleverly designed bearing assemblies not only guarantees the highest precision available but a very high load carrying capability. With over 500 installations worldwide the QuadSlimLine has proven to be reliable over high duty cycles while operating in the shop floor environment. 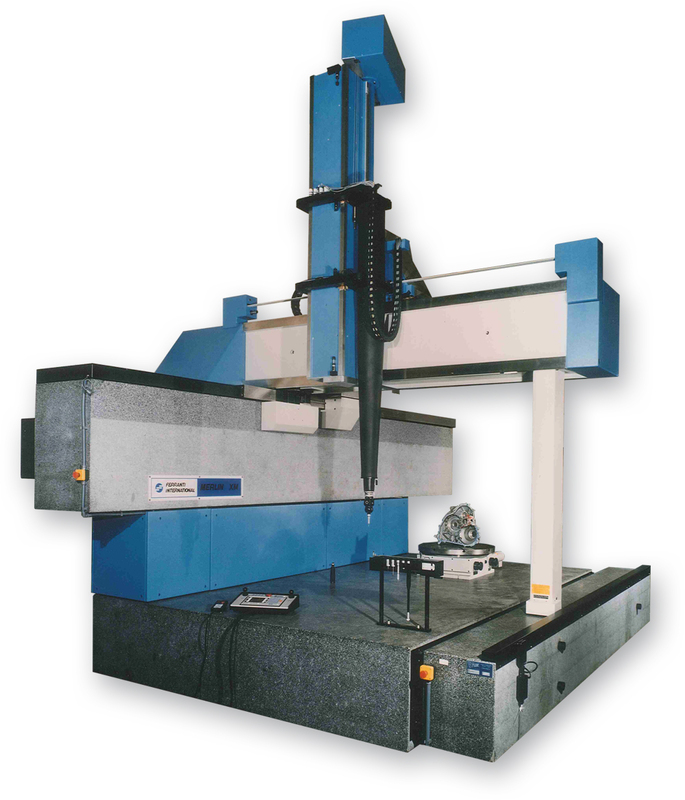 The introduction of a rotary table enables the operator to make better use of the CMM’s available measuring range therefore providing greater flexibility in what can be measured. 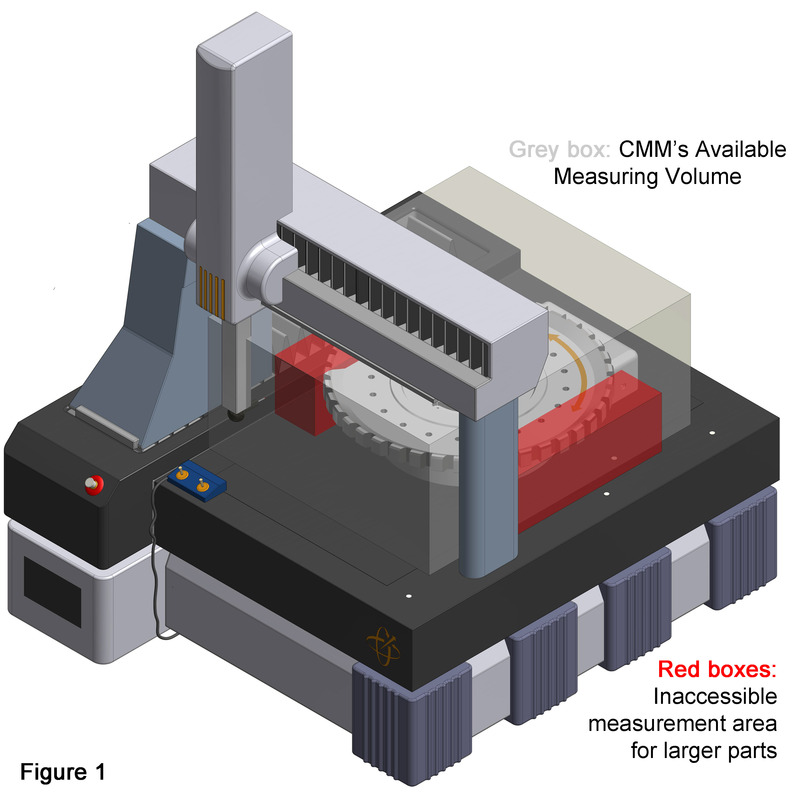 Figure 1 shows the impact of larger components on the useable measuring volume of a CMM. Voluminous styli systems are usually required to measure a workpiece from all sides which means a large proportion of that useable measuring volume is required just to ensure collision free movement of the stylus around the part, the areas of the component within the red boxes are therefore inaccessible and cannot be measured. 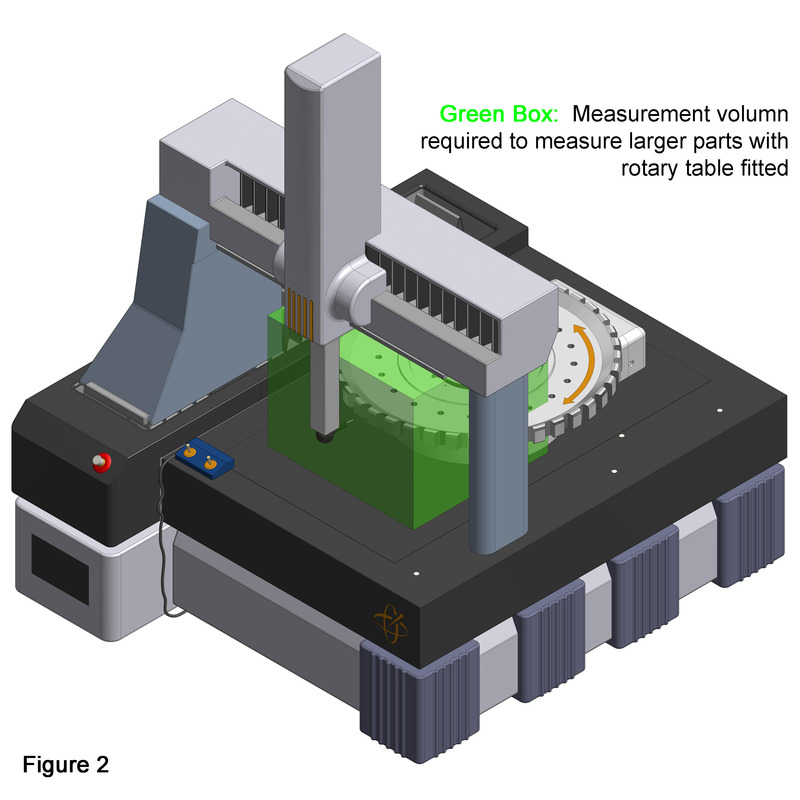 Figure 2 demonstrates that as an alternative to increasing the physical size of your CMM and its associated useable measuring volume the introduction of a rotary axis allows you to measure larger components using smaller linear moves as indicated by the green box. As a direct result of the introduction of the rotary axis a much simpler stylus system is required, measuring times are reduced, visibility is increased, programming becomes much more straight forward, and the smaller linear moves help to increase overall accuracy and reduce the influence from temperature. The Quadrant’s features have been designed to help you get the job done. 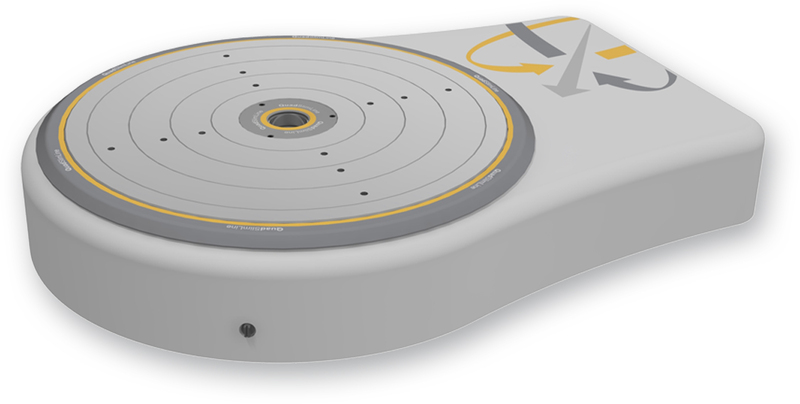 Air pads can be integrated into the base to enable the rotary axis to glide effortlessly over flat level surfaces. The rotary axis has been specifically designed with the lowest possible profile to minimise its impact on your CMM’s measurement volume. Standard sizes range from Ø400mm to Ø1000mm and are available with 2 bearing configuration to better suit your individual requirements. 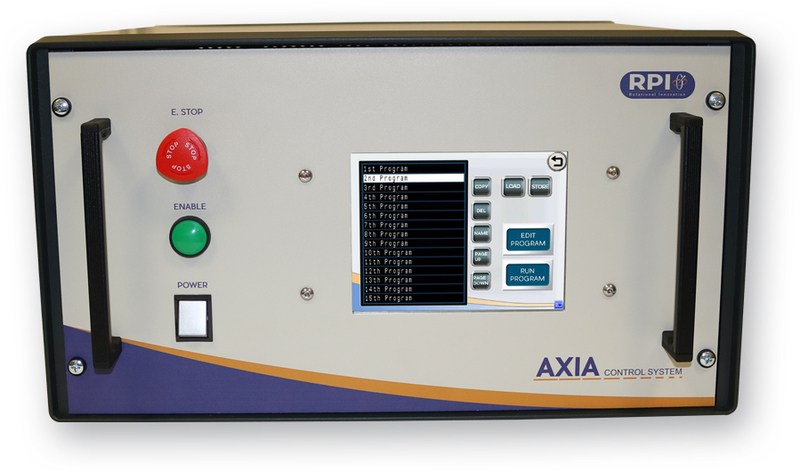 The QuadSlimLine has been designed to be fully integrated with your existing CMM control or via our third party Axia control. The drive system utilises a friction drive ring to eliminate any backlash between the servo drive and the table top it must position. The removal of backlash enables the drive to accurately position the table top without instability over its entire load carrying capacity. The design characteristics of the table drive negate axial and radial forces that would otherwise influence ultimate table geometry. Various encoder types from Heidenhain and Renishaw can be mounted directly to the axis of rotation offering positional accuracies of +/-1 to +/- 0.4 arc seconds. Incremental encoder signals provide the control system with 18,000lpr to 180,000lpr at 1vpp or as standard TTL. 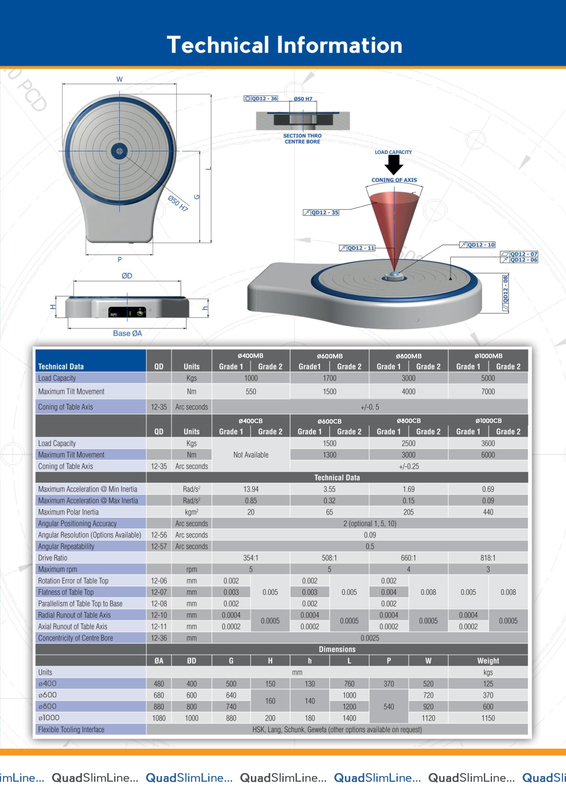 Distance coded and absolute encoders can also be supplied to reduce datum time. A visible pre-set service indicator is installed. A limit or proximity switch is fitted for use as a home reference in conjunction with the reference pulse of the encoder.